Why Vision Tools RadView ? A Powerful X-ray Workstation CR/DR modalities. Vision Tools RadView is a very powerful and scalable acquisition and viewing station for CR and DR radiography modalities including optional image stitching module for full spine full leg viewing and orthopedic measurements . 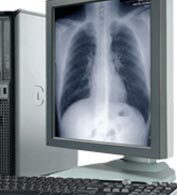 With its archiving capabilities, static and dynamic image viewing, variety of processing tools, printing features and reporting, the Vision Tools RadView application can be considered as an ideal solution for most doctors and users who need to increase their daily diagnosis productivity aiming to an improve of the provided patient healthcare service. View studies in multi-monitor configuration with automatic/manual hanging-protocols for comparison. Do windowing, zoom/pan, annotations, multiple measurements including true scale viewing. Stitch CR/DR images to produce single long image in an easy way. Built in advanced reporting tool to write reports , select from normal templates and update just the abnormalities. Insert images in the report. Voice dictation feature to dictate reports with voice to speed up the work. Included Web based reporting tool with templates to ease reporting from anywhere and any device (e.g. tablets and mobiles).